Lightweight, hand held drive units and screw anchor drives for the installation of screw piles in confined or low access sites such as crawl spaces. The units can be powered by portable hydraulic power packs. Over 34 years of design and development has produced the highest quality range of drives on the market today built. Backed up with industry leading warranty and factory backup. 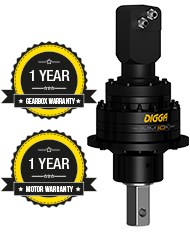 Digga planetary drives are specially designed for foundation and screw piling as well and setting ground anchors. (*) HH-6K Hand-held unit is not suitable for machine mounting. Warranty void if used on machines.